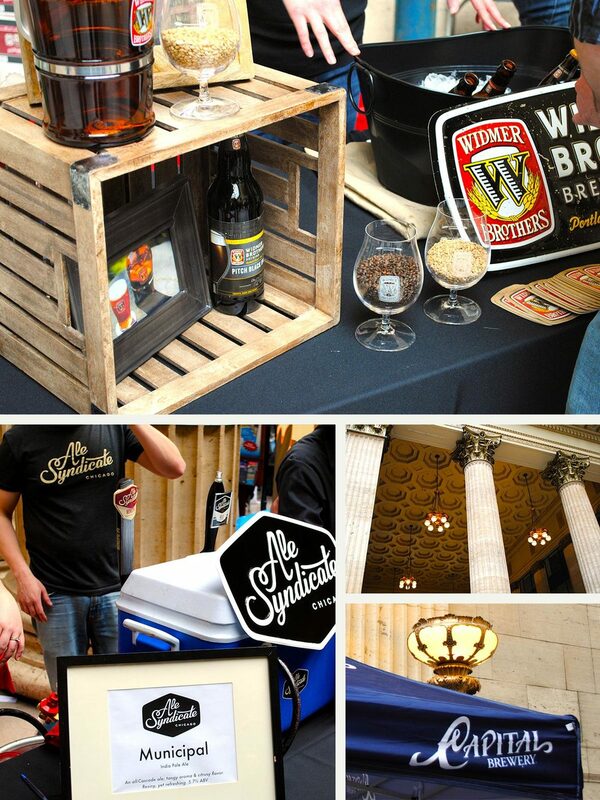 The end of March called for the 2nd Annual Chicago Beer Festival in Union Station's Great Hall. 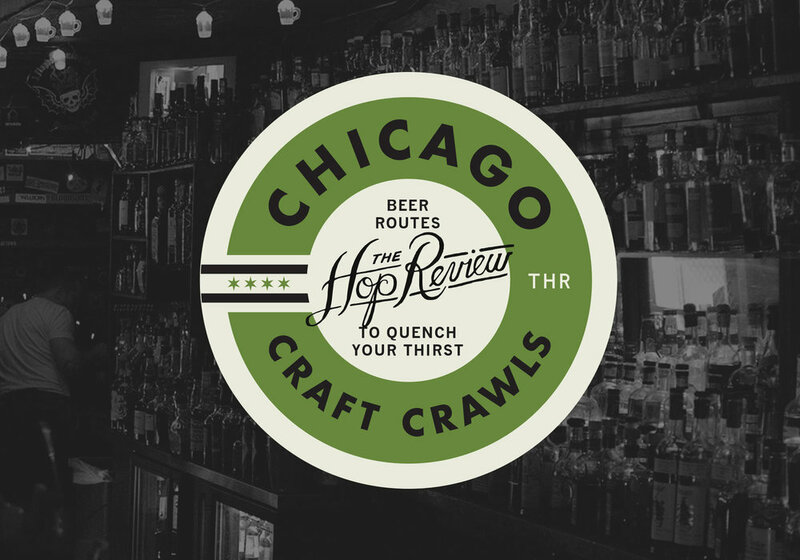 With winter in Chicago (hopefully, sort of) coming to an end, we could think of no better way to celebrate our warmer-weather-craft-beer-excitement than heading to the Chicago Beer Festival. 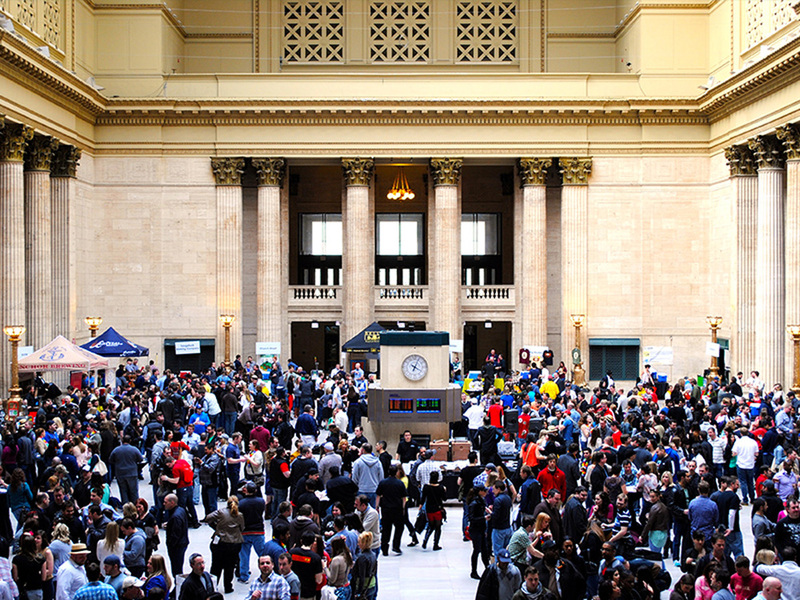 Kicking off its second year, the CBF again found its home in Union Station's Great Hall; just steps from the hustle and bustle of the arrival/departure train traffic, and befittingly as crowded as the popular Chicago thoroughfare itself. Although, the scene was admittedly less stuffed than last year's inaugural event, likely due to some drama stirred up before this year's event that caused many patrons to request admission refunds. In short, some rumors were stirred up that the soon-to-be American Beer Classic, to be held at Soldier Field in May, called 'shenanigans' on Chicago Beer Festival's drink disbursement policy, alerting the Illinois State Liquor Commission that they were instituting an 'all you can drink' offering, illegal in Illinois (and likely...everywhere). This caused the CBF to recall their unlimited samplings and institute a 20-sampling punchcard instead. But, whatever the reason for the slightly thinner crowds, we enjoyed our 1-4PM first session of the fest and wasted no time going after some new offerings, on our hunt to name the Top 5 Beers of the day. Our first stop was over at Emmett's (Palatine, IL) to taste some tried and true Chicagoland brews. And our memories served us correctly as the Victory Pale Ale reminded both of us what a staple 'pale' is supposed to taste like. Others that we found to be hearty, standard offerings for their respective beer styles were Widmer Brother's (Portland, OR) O'Ryely IPA, the Bohemian Blonde Ale from Lake Bluff Brewing Co. (Lake Bluff, IL), the Threadless IPA from Finch's Beer Co. (Chicago, IL), as well as the Pumpkin Smasher and Vanilla Stout from Big Muddy Brewing (Murphysboro, IL). A hearty, warming brown ale that is no stranger to the Chicago beer scene. Although it's not a new addition, you can't help but keep going back to what Flossmoor Station's got brewing. Church Street's take on an American IPA, garnering a distinctive hoppy flavor that's "brimming" (get it?) with a Cascade hop aroma. Finishes uniquely dry and refreshing. For a couple guys who hardly ever lean towards porters, this brew from Chicago's newest Ale Syndicate really got us reconsidering our selection habits. Another new Chicago brewery, another new favorite beer for the city's ever-growing catalogue. Like the name implies, this one is all about freshness. Fresh taste, crisp finish – an all-around winner as far as pale ales go. Maybe it's the mix of Cascade and Centennial hops, maybe it's their proud use of "pure, glacial Lake Michigan water." We don't really care, we just know we'll be trying it again soon when the patios warm up. We're somewhat partial to this darker IPA, from several previous pints, but we were glad to see it at the CBF nonetheless. Tried and true, and like most of Uinta's beers: distinct. For only its second year, we thought the Chicago Beer Festival did a pretty good job satisfying its patrons, especially considering its less than graceful reaction to the last minute liquor commission sanctions. CBF's onsite solution to this must've been forgetting to institute their punchcard system, because when it was all said and done, mine conveniently only had 3 punches. However, there are still plenty of things that could use improving. One marked bathroom?? And what's with all of the plain jane plastic signage for each booth...at eye level? Makes it a bit tough to plot your next stop. Obviously packing 70ish breweries in one great hall and a crowded side hall/bathroom combo has it's downfalls. So we're just hoping for a little more breathing room and legibility for 2014. Maybe wrangle Three Floyds & Half Acre to come on out too.